Hurricane Beryl, a tiny storm over the south-central Atlantic, is projected to take a path over the northern Caribbean. As of Friday evening, Beryl was moving westward at about 15 mph (24 km/h) and had maximum sustained winds of 80 mph (130 km/h). In the short-term, some increase in strength and size of Beryl is likely. By Sunday night, Beryl will enter a zone of conditions that are likely to inhibit its development. “Because of the small size of Beryl and anticipated weakening, widespread wind damage is not expected,” according to AccuWeather Meteorologist Jake Sojda. However, there will be some risk to lives and property along the storm’s path. People should take precautions. Steering winds will guide Beryl, most likely in a weakened state, on a slightly north of west path later this weekend into next week. This path may take Beryl close to the northern Leeward Islands on Sunday and near the Virgin Islands during Sunday night and Puerto Rico Monday. Trees that have been trimmed and utility lines and structures that have been properly repaired in the wake of hurricanes Irma and Maria from 2017 should fair well. However, lines and property repairs that have been jury-rigged could fail and lead to power outages and other dangers. “Rainfall from Beryl will be the primary concern from the northern Leeward Islands to the Virgin Islands and Puerto Rico,” Sojda said. Enough rain may fall to cause localized flash flooding and mudslides, especially along steep hillsides and in mountainous terrain. The hurricanes from last year have reduced some of the canopy of vegetation that would normally slow down the runoff of this magnitude. Beryl’s small size and forecast weakening near land is not likely to cause a significant storm surge. However, the risk of rough surf and rip currents will increase over the islands, especially along the east- and north-facing shores. Stay tuned to the latest on Beryl’s impacts in the Caribbean and Puerto Rico from AccuWeather and its world-renowned expert predictions. “Beryl is in the middle of a large swath of dry air,” according to AccuWeather Senior Meteorologist Paul Walker. 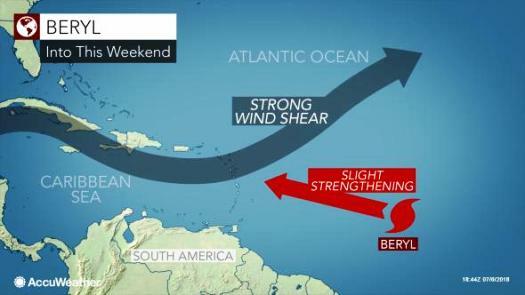 “While wind shear is low enough to allow Beryl to survive now, wind shear is projected to increase as the storm moves westward into the Caribbean late this weekend,” Walker said. Beryl’s small circulation may have prevented the storm from drawing in much dry air. However, the small size of the storm may also lead to a quick demise once it encounters increasing wind shear near the Caribbean. Beyond early next week, a general northwest to west-northwest drift is likely. Wind shear and proximity to the large islands of Hispaniola and Cuba would be deterrents for the storm’s survival and strengthening, but may still bring heavy squalls and drenching rainfall to part of the region.